I dream of a life without the obligation of labeling a record. A place where the parallelism of compositional attributes simply warrants pure delectation and implicit comprehension. 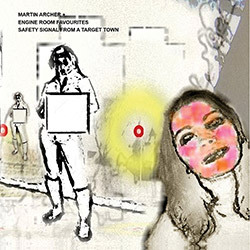 If this world truly existed, Martin Archer's tireless work would symbolize the necessity of forgetting about roots and derivations to better relish the fruits of sensible orchestral choices, in turn initiating terrific contrapuntal instances. Saying this might sound peculiar as the leader himself cites essential influences on his creations, especially AACM and British jazz with progressive tendencies; music that � in Archer's very words � combines "considered spaciousness and white heat improvisation". To achieve his goals the composer fully trusts the collective bravura of Engine Room Favorites, a unit of thirteen instrumentalists arrived at their third release. Besides Archer on various saxes we can savor the brilliant playing of Mick Beck (tenor sax, bassoon), Seth Bennett (bass), Graham Clark (violin), Laura Cole (piano), Steve Dinsdale (percussion), Peter Fairclough (drums), Johnny Hunter (drums), Kim Macari (trumpet), George Murray (trombone), Corey Mwamba (vibraphone), Walt Shaw (percussion), Riley Stone-Lonergan (tenor sax, clarinet). Impressively, the musicians managed to learn rather difficult parts as they were recording them in just two days. This quickness does not detract from the near-perfection of the execution, but surely enhances the overall vibe with doses of animate immediateness. Archer's assignment of melodic materials is flawless and finely balanced, the group's need of respecting the original directives going hand in hand with a splendid feel of acoustic democracy. You can focus on the wholeness and perceive it as an efficient organism � "dissonance" and "consonance" weighing the same, if those terms still make sense today � or get into the individual expressions, intuiting the beauty of a harmonious disposition inside a complex interplay. This album will have you singing (sort of), swinging, nodding, analyzing and reflecting together with an ensemble of skillful artists sharing the gift of unpretentiousness with their supervisor. The joint vision may refuse classification, but � in stark contrast with what we have been theorizing until now � we will end this writeup doing exactly that: Safety Signals From A Target Town is made of enlightened chamber jazz, with a definite proclivity � to borrow again from Archer � to "keep the blues close".